· ❀ WITH A FOLDING DESIGN: With an aesthetically very attractive design and fully foldable, making your drone a lightweight quadcopter easy to carry. · ❀ WITH ALtitude MODE: The drone is equipped with a barometer that allows you to keep the altitude of your drone constant for more stable flights and thus capture higher quality moments. 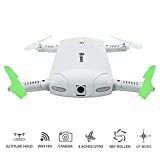 · ❀ REMOTE CONTROL BY YOUR SMARTPHONE: By connecting via WiFi the drone camera and your smartphone you can control the flight without difficulty. · ❀ NOTE: If you received the products whose tape has been demolished, do not worry, this is because we ship a product before doing the frequency test, in order to ensure normal customer use. If you are not satisfied with this, you can contact us to request a refund and a return. · Description: Brand Name: EachineProduct Name: Eachine E50 RC QuadrateFrequency: 2.4 GChannel: 4CHSpin: 6 EJMotor Type: Brushed MotorBattery: 3.7V 500mAh 20c (inlcuida) Charging Time: 120minsFlight Time: 8-15minsCharging Time: about 45 minutesDistance R/C: About 40mColor: white, roseResolution Video: 720 pMaterial: electronic components, plasticProduct weight: 0.073kgPackage weight: 0.241kgProduct size: 13.5 * 6.5 * 2.5cm (folded arms) 13.5 * 16 * 2.5cm (unfolded arms) Package dimensions: 15.5 * 8.6 * 6cmFeatures: ❀ Folding arms, small, easy to carry ❀ Fully innovative 720P integrated camera with which you will be able to take incredible selfies and effortlessly. ❀ Streaming via Wi-Fi that will allow you to take pictures and videos in real time to remember everything you´ve seen. ❀ Built with a barometer that will keep the flight altitude fixed to provide greater stability to the flight. ❀ Control the drone via the screen of your mobile phone using WiFi. ❀ With a sensor that will take your drone to fly automatically following the movements you make with your phone. ❀ With the return home mode you can make it back to your drone without delay. ❀ Four canals to descend, ascend, go forward, backward, diagonally left, right, and turn 360º. Note: If you received the products whose tape has been demolished, do not worry, this is because we ship a product before doing the frequency test, in order to ensure normal customer use. If you are not satisfied with this, you can contact us to request a refund and a return.